While I very much enjoyed the nearby British Airways oneworld lounge at Singapore Changhi Airport, I liked the Qantas lounge even more. Access is reserved for oneworld business or first class travelers as well as oneworld Sapphire and Emerald members. The lounge opens each day at 2:30p and remains open until 11:00pm. The lounge is located in Terminal 1. This is a very large lounge with multiple seating areas. Just past the entrance is an expansive seating area for several hundred passengers. The lounge does not have a la carte dining, but offers multiple buffet stations with a great selection of eastern and western cuisine. A noodle bar does offer some ability to customize. I enjoyed the Moroccan chicken dish tremendously…it had an amazing flavor that was far better than the dim sum I enjoyed on my Malaysia Airlines flight to Kuala Lumpur. But the best part of the meal was the cappuccino. There are self-serve machines, but avoid them. A barista will make you a far superior cup of coffee at the bar. The bar also had a large selection of alcoholic beverages. Past the dining area are restrooms and showers. More than a dozen private shower suites are available. While no Qantas First Class Lounge, I found this to be an excellent business class lounge (rivaling Hong Kong, though not quite as nice). I recommend you stop by here before the BA lounge, though both are worth a visit. 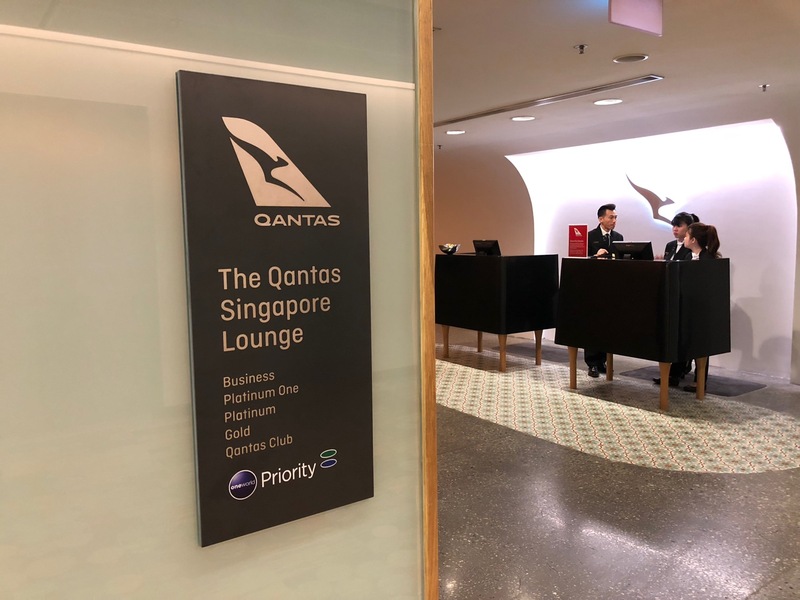 I find the Qantas Singapore lounge better than SQs silverkris lounges. SKLs are consistently crowded and lacks selection compared to Qantas. The Quantas lounge is certainly far superior to the BA lounge when it comes to food which is very good for a lounge. I’m not sure I’d entirely agree that there’s ‘no a-la-carte’ given they normally have a choice of 2 dishes you can order which are freshly prepared by the chef! I would suggest making sure you have a jumper available if visiting as there is an unfortunate tendency to keep the air conditioning on a little too high at times. Fair point and good suggestion!